From the Dawn of time the Aura has been talked about and named by many cultures. John White and Stanley Krippner, authors of Future Science, list ninety-seven different cultures that reference the human aura, each culture calling it by a different name. 97 cultures around the Globe have their own name for this. From the Jewish Faith, Islam, Hindu and Christian religions, Buddhist and countless tribal and Shamanic cultures all talk and visualise light. A Halo, a corona, a light body. When this takes place and is so commonplace there has to be a reason even if science has not managed to catch up just yet. But the good news it is, and fast. There are many human energy fields. These include the physically measurable electromagnetic and magnetic fields generated by all living cells, tissues, and organs, and the body as a whole. But there are also biofields—subtle or putative fields emanating from these pulsing units of life— as well as our subtle energy bodies, channels, and aspects of self. Here are brief descriptions of the most important human biofields. The layers of the auric field, as described by barbara ann brennan and according to the twelve-chakra system. It has long been known that activities of cells and tissues generate electrical fields that can be detected on the skin surface. But the laws of physics demand that any electrical current generates a corresponding magnetic field in the surrounding space. Since these fields were too tiny to detect, biologists assumed they could have no physiological significance. This picture began to change in 1963. Science has been actively involved in penetrating the mystery of the aura since the early 1800s. During that time period, Belgian mystic and physician Jan Baptist van Helmont visualized it as a universal fluid that permeates everything. The idea of the aura acting like a fluid—or flowing—as well as being permeable has remained consistent throughout history. Franz Mesmer, for whom the term “mesmerism” was coined, suggested that both animate and inanimate objects were charged with a fluid, which he perceived as magnetic, through which material bodies could exert influence over each other, even at a distance. Baron Wilhelm von Reichenbach discovered several properties unique to this human energy field, which he called the odic force, and would later be ascribed to the subtle body. He determined that it shared similar properties to the electromagnetic field, which had previously been investigated by James Clerk Maxwell, one of the fathers of electricity. The odic human energy field was composed of polarities or opposites, as is the electromagnetic field. In electromagnetism, however, opposites attract. Not so in the odic field, where like attracts like. Reichenbach also found that the human energy field related to different colors and that it could not only carry a charge, but also flow around objects. He described the field on the left side of the body as a negative pole and the right side as a positive pole, similar to the ideas of Chinese medicine. These and other theories have revealed the aura to have a fluid or flowing state; to be comprised of different colors, therefore frequencies; to be permeable and penetrable; and to be magnetic in nature, although it also has electromagnetic properties. 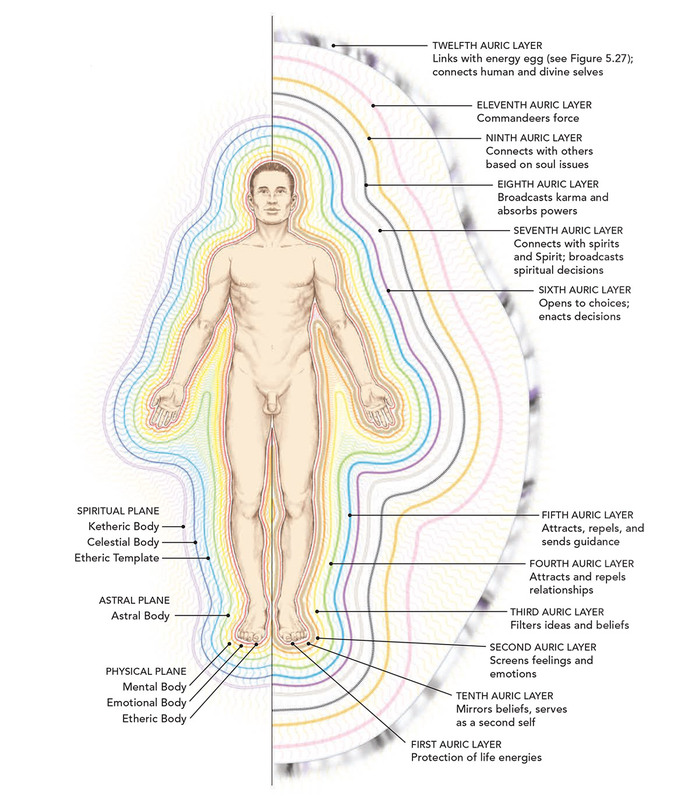 Other research has underscored these subtle body theories and expanded one additional element of the auric human energy field: its connection to the inner sanctum of the human being. During his studies, he observed energy pulsing in the sky and surrounding all animate and inanimate objects and beings. Many metaphysicians believe that orgone is equivalent to chi or prana. He also noticed that areas of congestion could be cleared to release negative mental and emotional patterns and thus affect change. This emphasized the connections between the subtle and the physical energies as well as emotional and mental energies. Then in the 1930s, Dr. Lawrence Bendit and Phoebe Bendit observed the human energy field and linked it to soul development, showing that the subtle forces are the foundation of health. Their observations are mirrored and expanded by those of Dr. Dora Kunz, a theosophist and intuitive, who saw that every organ has its own field—as does the overall subtle body—which pulses with its own rhythm when healthy. When someone is ill, these rhythms alter, and problems can be intuitively seen in the field. When Dr. Zheng Rongliang of Lanzhou University in China measured the flow of chi from a human body with a unique biological detector, he showed that not only does the aura pulse, but that not everyone’s human energy field pulses at the same rate or intensity. This study was repeated by researchers at the Shanghai Atomic Nuclear Institute of Academia Sinica. Soviet scientists from the Bioinformation Institute, headed by A. S. Popow, actually measured the human energy field, or more specifically, the biocurrents manifested in the surrounding energy body. They discovered that living organisms emanate vibrations at a frequency between 300 and 2,000 nanometers. They called this field the “biofield” and discovered that people with a strong and widespread biofield can transfer energy more successfully. This research was later confirmed by the Medical Science Academy in Moscow. A special form of photography is actually able to take pictures of the auric field. In the 1930s, Russian scientist Semyon Kirlian and his wife, Valentina, invented a new photographic process that involves directing a high-frequency electrical field at an object. The object’s pattern of luminescence—the auric human energy field—can then be captured on film. Contemporary practitioners are using Kirlian photography to show how the aura responds to different emotional and mental states, and even to diagnose illness and other problems. Medical science is now using a heat aura, as well as other imaging processes, to show the different aspects of the body’s electromagnetics. Gerhard Baule and Richard McFee of the Department of Electrical Engineering, Syracuse University, Syracuse, NY detected the biomagnetic field projected from the human heart. They used two coils, each with 2 million turns of wire, connected to a sensitive amplifier. In 1970, David Cohen of MIT, using a SQUID magnetometer, confirmed the heart measurements. By 1972, Cohen had improved the sensitivity of his instrument, enabling him to measure magnetic fields around the head produced by brain activities. Subsequently, it has been discovered that all tissues and organs produce specific magnetic pulsations, which have come to be known as biomagnetic fields. The traditional electrical recordings, such as the electrocardiogram and electroencephalogram, are now being complemented by biomagnetic recordings, called magnetocardiograms and magnetoencephalograms. For various reasons, mapping the magnetic fields in the space around the body often provides a more accurate indication of physiology and pathology than traditional electrical measurements. These concepts were ahead of their time, but are now being confirmed in medical research laboratories around the world. Scientists are using SQUID instruments to map the ways diseases alter biomagnetic fields around the body. Others are applying pulsating magnetic fields to stimulate healing. Again, sensitive individuals have been describing these phenomena for a long time, but there was no logical explanation of how it could happen. In the early 1980’s, Dr. John Zimmerman began a series of important studies on therapeutic touch, using a SQUID magnetometer at the University of Colorado School of Medicine in Denver. Zimmerman discovered that a huge pulsating biomagnetic field emanated from the hands of a TT practitioner. The frequency of the pulsations is not steady, but “sweeps” up and down, from 0.3 to 30 Hz (cycles per second), with most of the activity in the range of 7-8 Hz (Figure 2). The biomagnetic pulsations from the hands are in the same frequency range as brain waves and scientific studies of the frequencies necessary for healing indicate that they naturally sweep back and forth through the full range of therapeutic frequencies, thus being able to stimulate healing in any part of the body. Confirmation of Zimmerman’s findings came in 1992, when Seto and colleagues, in Japan, studied practitioners of various martial arts and other healing methods. The “Qi emission” from the hands is so strong that they can be detected with a simple magnetometer consisting of two coils, of 80,000 turns of wire. Since then, a number of studies of QiGong practitioners have extended these investigations to the sound, light, and thermal fields emitted by healers. What is particularly interesting is that the pulsation frequency varies from moment to moment. Moreover, medical researchers developing pulsating magnetic field therapies are finding that these same frequencies are effective for ‘ jump starting’ healing in a variety of soft and hard tissues, even in patients unhealed for as long as 40 years. Specific frequencies stimulate the growth of nerves, bones, skin, capillaries, and ligaments. Of course Reiki practitioners and their patients have daily experiences of the healing process being “jump started,” and academic medicine is now beginning to accept this therapy as logical and beneficial because of these new scientific findings. In Figure 2 we have bracketed portions of the signal that correspond to the frequencies used in medical devices that stimulate the healing of particular tissues. Individual differences in energy projection and detection. It is not widely understood that “brain waves” are not confined to the brain, but actually spread throughout the body via the perineural system, the connective tissue sheathes surrounding all of the nerves. Dr. Robert O. Becker has described how this system, more than any other, regulates injury repair processes throughout the body. Hence the entire nervous system acts as an “antenna” for projecting the biomagnetic pulsations that begin in the brain, specifically in the thalamus. Moreover, waves that begin as relatively weak pulsations in the brain appear to gather strength as they flow along the peripheral nerves and into the hands. The mechanism of this amplification probably involves the perineural system and the other connective tissue systems, such as the fascia that are intimately associated with it. After centuries of neglect, energetic therapies can take their appropriate place in clinical medicine. Perhaps now we can finally rediscover and continue the evolutionary work our ancestors begun many thousands of years ago. And with the wonderful advances and knowledge we now possess thanks to science we can integrate this with existing and ancient wisdom. In the next article in our series on The Human Bio-Energy field, we will discuss in greater detail the auric layers and the Bio-energy field in greater detail. Journal of Bodywork and Movement Therapies, Harcourt Brace & Co., Ltd., Edinburgh. This Article is comprised of the wonderful information within the links in the references above and is reproduced in respect and love with a Creative Commons Attribution-NonCommercial 4.0 International Public License.